Our preferred file for printing is a high resolution PDF (Portable Document Format), with all fonts embedded and a CMYK profile included. (We use FOGRA39). 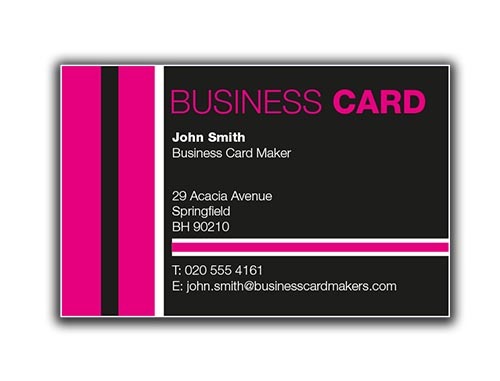 All our printing is done as 4 colour process, unless you require a PMS (Pantone Matching System) for a particular colour. This will add extra cost. Please discuss this option with the sales team. The above image displays a print file after has been printed. The registration (crop marks) and bleed are clearly visible, ready to be trimmed to its final size. If your files have colour or images that go the the edge of the document, your file must include at least 3mm of excess waste image (Bleed). This will be cut away prevent your document from having a small white edge. We also advise a ‘quiet area’ around the perimeter of your document. 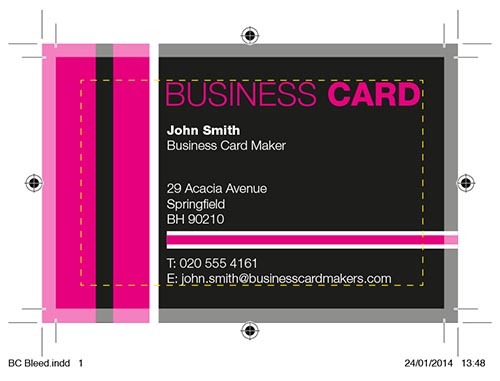 On this business card example this is 5mm, as demonstrated by dotted yellow line. During printing your document can move from its target position by very small amounts. The bleed ensures the movement won’t be effected by this. This is the final trimmed document. The surrounding bleed and crop marks are now gone. Various templates can be found here.